Dianne Bennett is a middle-aged woman, slightly pudgy, with light brown hair. When teaching economics in class, Bennett's byzantine diagrams on the chalkboard resemble football plays, leaving practically all her students in a fog when trying to understand what she's writing. Bennett also seems to be at least partially in charge of accounting in Lawndale High, as she is seen discussing this topic with Angela Li in "Fizz Ed" and "Fair Enough". Based on "Fair Enough", she shows forward planning with her budgeting - ensuring the library would be able to renovate its roof - but is unaware that Li is pilfering from the funds to buy more security equipment. She appears to enjoy having Daria Morgendorffer as a student, and was inspired by one of her sarcastic comments to run a field trip in "Malled". Diane Bennett is married to a man named Herbert and both collect stuffed toys called Fuzzy Wuzzy Wee Bits, which seem to be a parody of Beanie Babies. 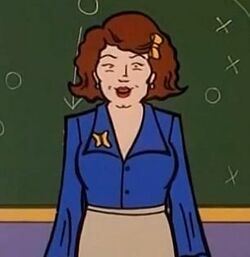 she is known for having an unexplained hatred of pennies and loving the "clicky-clack sound" that chalk makes on a blackboard ("The Daria Diaries"). her voice actress is Amy Bennett, though it is not known if the character and actor were designed to have the same last name. This page was last edited on 11 May 2016, at 15:51.